ENTER YOUR EMAIL TO STAY UP TO DATE! Part 1:- Domain Verification For Blogger Open your Blogger account >> Then blog settingsIn Blog Address box click on Add Custom Domain and Type your domain name same as shown below. 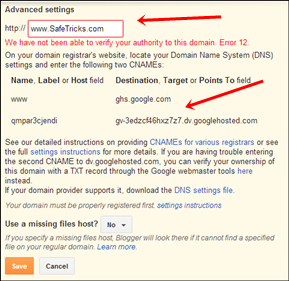 Then it will show error for verification just note down details or otherwise leave that tab open and follow below Part 2 in new browser tab.Part 2:- Settings For GoDaddy Domain Name For Blogger First of all log in your Godaddy account then select your domain open Settings tabThen Switch to DNS Zone File just in right side of settings. I was just recently scammed out of 3380 dollars in earnings. Although I am not going to reveal the name of the scammer, I am going to tell the whole story and would be happy to give full details privately to anyone who asks!! After the scammer stole my earnings, he then sent out a nasty blog post stating I was removed from the company for "bad marketing" . Here are videos that prove he is not only a scammer but a liar. He stole my techniques then used them as his own training! In this next video, I show that I still have an active account with an unpaid balance. This video was filmed today. I also show a better company. HERE IS FURTHER PROOF OF HIS LIES. HE IS TELLING EVERYONE MY ENVIRALIZER ACCOUNT WAS CLOSED. IT IS STILL ACTIVE AND I AM STILL AN ACTIVE MEMBER! WATCH! IN THIS VIDEO I WILL SHOW SCREENSHOTS FROM PEOPLE HE HAS ALSO STOLEN FROM EITHER WITH ENVIRALIZER OR BY STEALING SALES WITH A PLS SHARE CODE!